The opening words of Ps. lxxxiv. 5 : "Blessed are they who dwell in thy house: they will be still praising thee. [In A. V.] Selah." This verse, interpreted by Joshua ben Levy to signify that those who sit pondering on the greatness of God before offering their prayer in the house of God are the really "blessed ones" (Ber. 32b), is, together with (the closing words of Ps. cxliv. 15) "Ashre ha-'Am," "Happy the people to whom this is allotted [A. V., "that is in such a case"], happy the people whose God is the Lord," recited three times a day, twice in the morning and once in the afternoon prayer before Ps. cxlv., concerning which it is said: "Whosoever recites Psalm cxlv. three times a day may feel certain of having a portion in the life to come" (Ber. 4b). The three Ashre or beatitudes in the two introductory verses—some added also the Ashre of Ps. cxix. 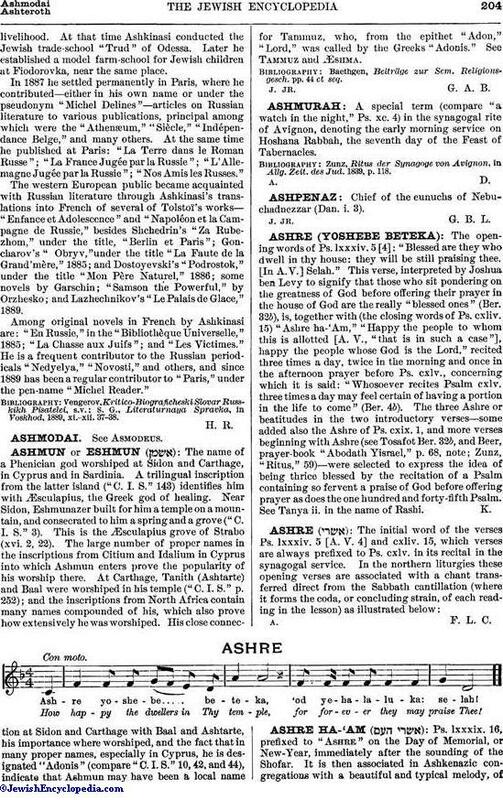 1, and more verses beginning with Ashre (see Tosafot Ber. 32b, and Beer, prayer-book "Abodath Yisrael," p. 68, note; Zunz, "Ritus," 59)—were selected to express the idea of being thrice blessed by the recitation of a Psalm containing so fervent a praise of God before offering prayer as does the one hundred and forty-fifth Psalm. See Tanya ii. in the name of Rashi.